The Olympus Stylus XZ-2 is a compact and powerful digicam. It provides higher image quality and better performance than you will find from most compact cameras; but, it comes at a cost with a MSRP of $599 USD. Read more in our Full Conclusion. There are too many flagships to keep track of these days, but here's the latest one. Filed under Olympus' "flagship point-and-shoot", meet the STYLUS XZ-2, which boats many of the same technologies from Olympus' Micro Four Thirds and dSLR cameras. Basically, this is the point-and-shoot camera for dSLR enthusiasts who want high resolution images while holding a convenient compact digicam. But what makes this little camera so fancy? Well, it has plenty of strong specs, which we'll list in a moment, but what's notable about the XZ-2 is what Olympus calls the "world's first hybrid control ring." See the thing that looks like a focus ring around the 4x optical zoom lens? Well, whenever the Fn 2 lever next to said lens is in the "down" position, the hybrid control ring switches into analog mode -- it becomes a focus or zoom ring. Pop the Fn 2 lever into the "up" position, and the ring clicks into digital mode. No longer smooth-turnin', the ring clicks around, allowing users to change exposure-related settings. Hybrid control rings aside, the XZ-2 is a well equipped camera, featuring a 12-megapixel BCMOS image sensor, the aforementioned 4x optical zoom, and the TruePic VI Image Processor; which is popping up on much more expensive cameras. Speaking of that zoom lens, it is rated between f/1.8 at its widest angle to f2.5 at full zoom? That's practically unheard of in the point-and-shoot market, and should allow pros and newbies alike to take some impressive shots; whether in lower lighting, or when trying to capture some pleasing bokeh effect in close up shots. The XZ-2 also features Full HD Video recording, which takes advantage of the Touch AF Shutter function (press the 3.0-inch touch screen, and the camera will focus on that spot while you shoot video, or focus and snap a still photo). DUAL Image Stabilization will keep your stills clear and your video smooth. iAuto will let the camera pick and choose settings for less experience shutterbugs (hey, they call them "point-and-shoot" for a reason!). But if you're feeling adventurous, try out one of the 11 Art Filters or 5 Art Effects. Olympus is also excited about FlashAir capability, which boils down to this: Toshiba makes WiFi-capable storage cards (similar to Eye-Fi cards) and when you combine one of those with the Olympus Image Share app (for Android and iOS smartphones and tablets), your the XZ-2 will be able to load images onto phones and social networking sites. The camera is also Eye-Fi compliant. 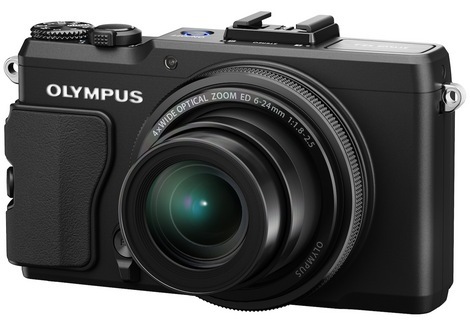 The Olympus STYLUS XZ-2 is available in any color you want, as long as it's black. The MSRP is $599.99 USD, however you can check the most current online pricing by clicking our Lowest Price button at the top right of the page. You can check out the price of this camera on Adorama by clicking here.